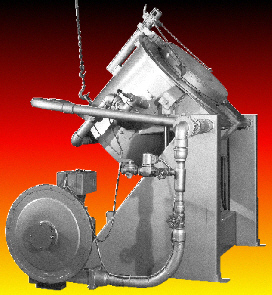 NOSE POUR TILTING CRUCIBLE FURNACE-max temperature 2400 deg F. Furnaces operating above 3000′ elevation may require a larger blower and manifold to operate with the same efficiency. Please let us know the elevation. The nose pour feature permits precise control of molten metal flow into a mold or pouring ladle. The nose pour configuration locates the crucible pouring lip coaxial with the trunnion bearings, so it is in a constant position during pouring. This provides greater safety and the shorter molten metal stream reduces the amount of hot metal exposed to cooling and oxidation. The tilting mechanism is available in either hydraulic or manual hoist configuration, as shown in the illustration. The hydraulic tilt is designed with two double acting cylinders with hydraulic pump, valves and control systems. The manual hoist system employs an overhead chain, electric or air hoist (furnished by customer) to tilt the furnace. Each design assures a smooth pouring action. 10-12 oz. 2" 1-1/4" 4,509 lbs. T-600 No 600 1800 36"Dia - 36"Deep 127" 96" 63" 24" 82" 20" 5 HP 3,000,000 2.5" 2" 13,000 lbs. 900082 T200-HT-PC with proportionating control. This allows the gas/air mixture to stay in proportion at all levels of the firing rate, from high to low, helping the furnace operate at maximum efficiency, while still maintaining a fast melt rate. A single switch operates the burner. 5 HP 4,000,000 2-1/2" 13,590 lbs.